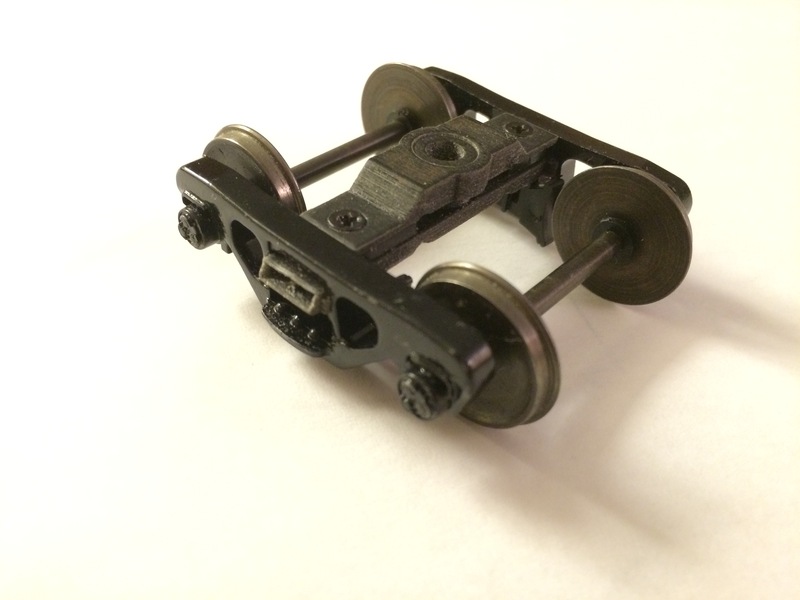 Since the axle ends don’t need to protrude, the shorter axles will work just fine. The axles you see in the above photo are, in fact, NWSL 33″ axles, not 36″. The truck in question is a 100 Ton truck, thus it should have 36″ axles, but at the time, that’s what I had and I used them. Now, I prefer Protocraft axles, but I will discuss needs and the issues with the NWSL axles in future posts. Again, if you want to order directly from me, the cost per bolster will be $15, plus shipping and I will inspect and clean up the bolsters before shipping them. Please contact me at toruk2010@live.com. Next > The Question of Axles …. Technically speaking, you can also use this bolster for the old style 70 Ton roller bearing trucks as well as they are essentially the same. If you have the solid, non-rotating bearing caps, then you can use Protocraft 33″ wheels and axles. If you have the rotating ends … then you have to use NWSL wheelsets and … choosing the right axles gets more complicated. I’ll be looking forward to that next post on Protocraft vs NWSL wheels and axles. Currently working on a Atlas boxcar with the old-style trucks (thicker sideframes) but it has the rotating end caps. Before knowing the difference on the side frames, I ordered the new-style DIR bolsters. With them I found that the wheelsets slop about in the frame and don’t protrude enough to use the rotating caps and figure this is due to differences in the side frame thickness and incompatible bolsters setting things up incorrectly. I have two sets of old-style DIR bolsters on order so I’ll test it again with those.